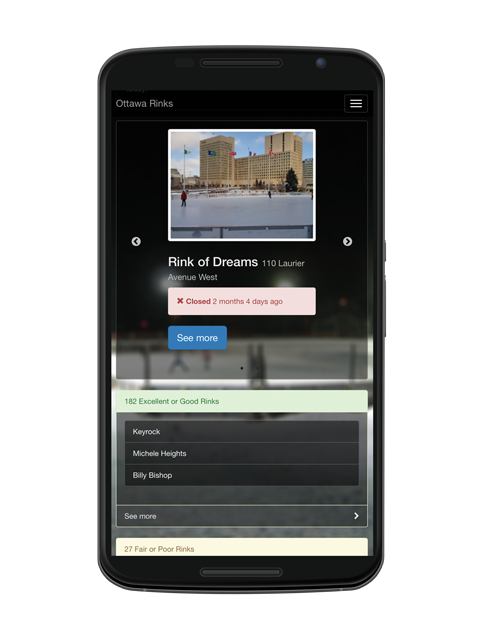 Ottawa Rinks is a tool for the residents of the City of Ottawa. Users can find and add ice conditions of local outdoor rinks. There’s no easier way to find the nearest sheet of naturally frozen ice in the city. The Ottawa Rinks website features 100% custom programming using PHP web application framework. We also re-thought the database schema to enable easy modular programming that is easy to understand and write. The website interface is built with Bootstrap, mobile first front-end framework with some neat homepage modifications to bring a dynamic look and feel to the website based on daytime or nighttime visits. In the 2014 – 2015 season, new features included the ability to post condition updates to the site by sending a text message to a local phone number and a new street team sign up and downloads area. Check out everything the Ottawa Rinks website has to offer!